Distributed consensus protocols (algorithms) provide the necessary means for a distributed network or system to agree, verify and validate transactions without the need for a central authority (e.g. Visa, Mastercard and financial institutions). In Tangram, the network uses a Proof of Stake consensus algorithm, which means it falls under a similar category of consensus protocols used by several other cryptocurrencies. We believe that future cryptocurrencies will need to prove sustainable, with a lower impact on the environment than many current models. A Proof of Stake mechanism offers this advantage among many others. Anyone who holds a set amount of the system’s base currency is eligible to become a validator. A potential validator then issues a special type of transaction that enables them to be considered / chosen / entered as a validator. The blockchain keeps a record of these validators. When a transaction or transactions are sent, the consensus algorithm then provides validators the opportunity to participate in validating the transactions. From an algorithmic standpoint, Tangram uses a Practical Byzantine Fault Tolerance-style (pBFT) Proof of Stake algorithm, whereby, simply put, validators are randomly chosen. However, users will need to offer themselves as validators in order to participate in the consensus arrangement, i.e. to propose or agree on which transactions / block of transactions are correct and should be considered a part of the network. The BFT consensus algorithm will continue to function correctly even if ⅓ of the validators are a) dishonest / malicious / attackers, or b) offline (faulty validators), without deprioritizing safety and liveness (core properties of BFT-style consensus algorithms). Consistency: Every read receives the most recent write or an error. Availability: Every request receives a (non-error) response — without the guarantee that it contains the most recent write. This means that if more than ⅓ of nodes are dishonest, faulty, etc., then the consensus algorithm will prioritise SAFETY (consistency) over liveness (availability). To deliver a more robust setup, an algorithm can be modelled which allows for the highest possible availability while prioritizing consistency. After main-net delivery and network proliferation, we will have enough data and resources to research this and will be putting effort into developing and refining such an algorithm. pBFT was first proposed for use in a distributed system in 1999 by Miguel Castro and Barbara Liskov. Clients (send and receive replies from a network of nodes) send a request to the leader node. Leader node (primary) multicasts the request from the client(s) to secondary nodes (used to support the consensus algorithm). Nodes then execute the request sent by the client and reply to the client. The client waits for f(maximum amount of nodes that may be fault)+1from different nodes with the same result, which is the result of the operation requested. Note: Keep reading to see how this consensus algorithm has been adapted and implemented in Tangram. 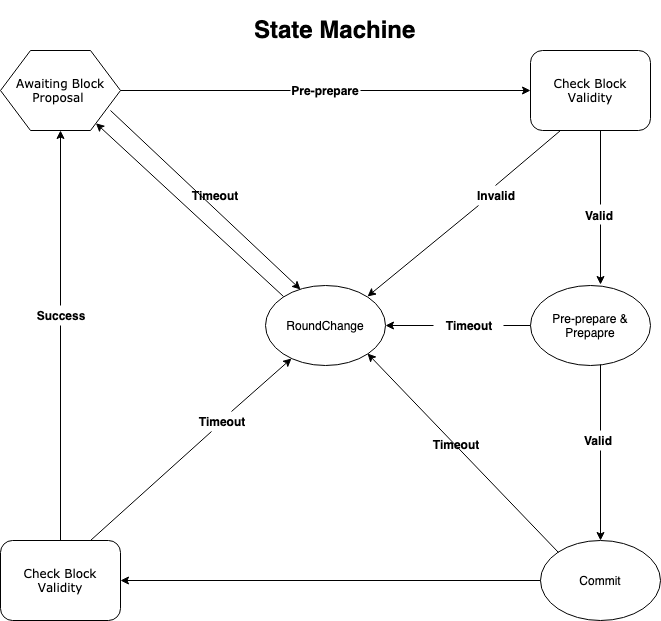 The consensus algorithm has three primary phases that are a form of state machine replication. Messages are exchanged between nodes depending on their state, with each node maintaining a state per ‘decision’ which is required to be reached, namely a current view number, and a list of input messages and output messages. We will try to explain these in their simplest form. The pre-prepare and prepare phases are used to totally order requests sent in the same view, even when the primary node which proposes the ordering of requests is faulty. (A primary node is a leader node that handles final consensus decisions and commits blocks to the DAG, among other actions, e.g. publishing). The prepare and commit phases are used to ensure that requests that are committed are totally ordered across network views, i.e. a one-time picture of the network comprising of blocks, agreements, validity on transactions and termination of others. Side note: All participating validator nodes agree on the total ordering of transactions. This is guaranteed for all nodes. Pre-prepare: Initiates the first block to be propagated across the network and broadcasts to other nodes within a membership list. Prepare: Initiates validity conditions and contents of the message type. Commit: Decides the ordering of the block within the DAG and verifies all message types received by nodes. Pre-prepare > Prepare: Node who first proposed a new block broadcasts a pre-prepare to all other nodes within their membership. Prepare > Commit: When a node receives its corresponding pre-prepare, it begins to broadcast prepare, which includes the contents of the pre-prepare and prepare messages. Pre-prepare > Prepare > Commit: Nodes await prepare messages, and once received with its set conditions and correct views, the node will begin to broadcast commit. All of the message types above which are sent or broadcasted will be included in the nodes output message list. Side Note: All nodes await the message types (pre-prepare prepare and commit). At any “point” when nodes are broadcasting or awaiting message types, a node may emit a view-change and increase its view (+1). If any nodes include a block with the message type of commit, a P variable is included with all commit message types that have the corresponding block. Nodes cease accepting any new messages that have past views, and cease sending any new messages for past views. Nodes await a view-change message and include this in their list of input messages. The states will transition through the normal operation phases as above. Most pBFT-based consensus algorithms follow the design of having a constant leader who is a primary node and who accepts all requests while proposing blocks to the rest of the network from other nodes and / or clients. This means that these networks are synchronous, and may cause further challenges such as network communication errors. In addition, a malicious leader may cause hindrance to the network. In a leaderless based pBFT system, leaders are executed on a first come first see block basis; i.e when a block gets seen in the network it will start a round (see state transition diagram above) with each node in its membership ring, and this continues with each new block, allowing for asynchronous communication. Any client (in Tangram’s case this would be anyone operating through a light-wallet and submitting transactions) may connect to any node and submit their transactions. They may then observe and determine if their transaction was successful, and if for any reason it is not, they may select a different node and re-transmit the transaction. Side note: Blocks are added to the memPool in order, whereby the Proof-of-Stake protocol will proceed and finalise. The consensus algorithm is inextricably interwound with coin properties and attributes, and these are used during the consensus process. Therefore properties and attributes of transfers / transactions are considered an instance of consensus in Tangram’s network. Honest nodes monitor the chains of other nodes. If they do not locate their blocks within other nodes’ chains, they may re-transmit them. If the honest node that is monitoring sees any missing information, they may request it from all other nodes. Efficient for high numbers of transactions . Network operations do not depend on the quorum slice or node stake. Flexible in its design and integration with higher level protocols (i.e. Proof of Stake). Keep up to date and join one of our channels below!